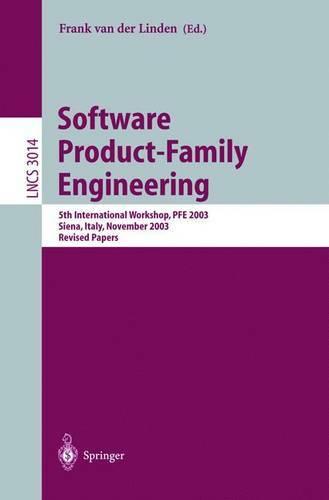 This book contains the proceedings of the 5th International Workshop on Product Family Engineering, PFE-5. This workshop was held in Siena, Italy, November 4-6, 2003. This workshop was the fifth in the series, with the same subject, software product family engineering. These workshops have been held initially irregularly about every 18 months since 1996. Since 1999 the workshop has been held every second year in the fall. The proceedings of the second, third and fourth workshops were published as Springer LNCS volumes 1429, 1951 and 2290. The workshops were organized within co-operation projects of European industry. The first two were organized by ARES (Esprit IV 20.477) 1995-1999; this project had 3 industrial and 3 academic partners, and studied software architectures for product families. Some of the partners continued in the ITEA project if99005 ESAPS (1999-2001). ITEA is the software development programme (?! 2023) within the European Eureka initiative. ITEA projects last for 2 years, and ESAPS was succeeded by CAFE (ITEA if00004) for 2001-2003 and FAMILIES (ITEA if02009). This fifth workshop was initially prepared within CAFE and the preparation continued in FAMILIES. As usual Henk Obbink was the workshop chair, and Linda Northrop and Sergio Bandinelli were the co-chairs.